The "Repulsin" type B , uses the "implosion effect" in vortex..
Vortex Tubes for spot cooling by Newman Tools Inc. 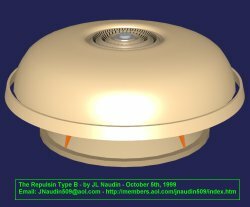 Unless otherwise noted, all materials at this site (including without limitation all text, html markup, graphics, and graphic elements) are copyrighted ©, 1997-2003 by Jean-Louis Naudin. The material available through this site may be freely used for attributed noncommercial educational purposes only. We ask that due credit and notification be given the author.